Released in 2004 by Traveller's Tales, Crash Twinsanity was a bit a return to form for the series after a foray in kart racing and party games. Featuring a full 3-D world a wide cast of characters (including the villianous Dr Cortex as an ally), Crash and company must join forces to save their beloved N.Sanity Island. Best time with deaths: Single-segment 1:04 by Dylan 'DRsynj' Rothwell on 2012-08-24. 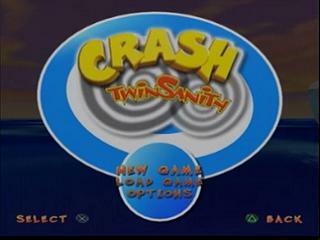 Crash Twinsanity is the 'open world' Crash, often viewed in the shadow of its former (Naughty Dog) titles. This isn't prominent with me, all I have to say is; Travellers Tales was great pre-2006 and my Crash 3 disc doesn't work. With the HUB world and loading times disintegrated into a, still fairly linear, map and tunnels it's a very high intensity and speedy experience, only stuttered by a number of *HILARIOUS* cutscenes. Routing is mostly designed around the rigid slide-jump and long jump glitch, these make up the majority of sequence breaks (of which I spend more time executing than playing the game's instructed routes,) and are generally a faster form of movement. I'm proud to have made a run that is an entertaining watch start to finish, it's neither an endurance run nor a movie checkpointed by TAS level execution tricks, it's just a non-stop thrill ride with imaginative routing, constantly high level execution and a lot of showing off. This has been a fast few months and I have met a lot of amazing friends in the speedrunning community, and recently got to meet many of them at ESA; the European Speedrunners Assembly, a marathon similar to AGDQ but held in Europe. I got to show off Crash Twinsanity there on stream and all the support I got motivated me to do this run. Before this, at the beginning of 2012, I had been very nervous about communicating across the internet, it's never been a part of my life until now and there is one person in particular I have to thank for settling me down and being such a great friend through this process: Cyprys, I trust this won't be the last time his name is featured on an SDA game page and I wish him the best with whatever he has planned for SDA. Samura1man, for his Crash Twinsanity speed running research that I was incredibly happy to have for use and for his support. Sonikkustar, for his consistency and motivation in the SDA Twinsanity thread and for the first boss fight strats. The entire Crash/Spyro group (consisting of various "I'm A Speedrunner" members, SpeedRunsLive guys and others) for keeping the crash and spyro games circulating with interest and encouraging me to get this run completed. Zaku_III, M3RM41D, VinceofAllTrades, Neviutz and Zoning1138, for each being my single best friend while I was working through a tough time in my life (which was directly while I've been speedrunning Crash Twinsanity.) It's because of them I've been able to have the confidence to be a part of ESA 2012 and to grow as a person. The verifiers, admittedly the lack of competition for this game is a little discouraging but I am mighty pleased to have you guys and your input. Last but not least, DAVIIIID; for being the collective name for all the people in development teams with the stupid ideas speed runners abuse, such as "Hey! I know! Let's extend Crash's body higher at the peak of his jump when he body slams!" Q: What is long jumping? A: By executing a slide-jump (run, press circle and then X mid-slide,) then jumping at the edge of a platform you get an extended jump that will cross a few gaps that are impossible to cross with a normal jump. If it doesn't look like I have done this it is because I have routed that particular point to avoid having to jump before I need to long jump, I can do whatever I like (spin, slide, spin-throw Cortex) as long as I don't 'neutral' jump between slide-jumping and long jumping as this neutral jump will cancel the effect. Crash Twinsanity is no exception to the NTSC-PAL cutscene speed difference, but there are physical mapping differences between the two, such as the tree NTSC uses to skip Totem Hokum that isn't present in PAL making this particular skip harder to execute in PAL. As for PS2 against Xbox, there is no noticeable difference between the two. 0:00:12 - Timing starts as you press X on the 'autosave disabled' screen, this screen is also present if you're using autosave (it will say 'autosave enabled'.) This marks the time you gain control of Crash. 0:00:56 - I jumped into the cutscene at an angle to line up for this slide jump, I then land at the chasm to get a long jump from it propelling me further forward. 0:01:15 - This sequence of slide jumps is tricky, you can change the timing of pressing X during a slide to get a longer or shorter slide jump, usually I want the longer version but here I need short slide jumps to have the right spacing to get past Cortex. Interestingly Cortex has a hitbox here so it's important not to run into him. 0:01:55 - There's a small notch in the wall you can stand on, this sequence breaks the worm thus avoiding having to waste time waiting for the worm to move from hole to hole. 0:02:02 - All of the platforms in this game have a generous size compared to how they look, on many of them you can execute sequence breaks by jumping from what looks like the empty space off a platform (such as is necessary to execute the long jump,) this is always risky without practice as if you fail you just fall off. On this particular platform you can cross the gap by simply jumping across, skipping using the tree. 0:02:04 - The first real example of a long jump. I slide jump across the first gap then use the 'stored' slide jump to execute a long jump over next gap, this skips using the falling tree. 0:02:46 - This long jump skips using the 'skate-board' sequence, a little faster. 0:02:51 - When the checkpoint goes off upon entering the arena I jump into the spikes on the wall to kill myself and respawn as the boss fight begins, this skips a long cutscene. Crash has 2 death animations here: The 'falling over' one I got and one where Crash turns into a pale angel and floats upwards, this angel animation is a bit longer so it's nice that I got the simple animation here, although, it's not something I would reset over. 0:03:06 - You can jump onto the plasma blasts without being hit, it will carry Crash upwards and because of Crash's positioning when I jump I will be flung to the edge of the Arena. From here I hit the plasma blast back and position myself where Cortex is going to recover, using the belly flop, which seems to have the same qualities as the plasma blast, I take out the rest of Cortex's health. If I belly flop him as his scooter spawns or when he starts walking onto his scooter the game will freeze, so it's important to hit him between these 2 moments. 0:03:20 - Now I try to exit the arena before Mecha Bandicoot gets in, destroying the floor. There's a small letterbox sized gap above the gate that I can get through if I time a belly flop at the right height, this is because the belly flop is the only way I can adjust Crash's hitbox to be thin enough to get through. 0:03:32 - Listen out for Cortex dying in the back, this happens because if the camera is not being focused towards him long enough the game won't load his next animation. With him stuck Mecha Bandicoot will jump onto of him and kill him, which results in some more funky things through the rest of the boss fight, namely: N-Gin will disappear from the Mecha Bandicoot's cockpit after I take out his saw with 2 hits and only after I take out the rockets will the model change to show his arms being destroyed. 0:03:37 - Now I'm out of the arena (just in time) I'm pretty much safe from all Mecha Bandicoot's attacks except the plasma blast, which I need to be able to bounce it back. So here I just wait out this part of the fight until the last 3 hits. Once both Mecha Bandicoot's arms are destroyed he will only use the plasma blast and every time he takes a hit he will get slower charging the shot; so I can jump out of the arena when he fires getting the blast stuck in the loading zone, this allows me to store them and fire them back all at once thus avoiding the slower charging sequences. You may also have noticed that Mecha Bandicoot killing Cortex depleted its' health by 1 point, this doesn't actually mean anything as he still requires every scripted hit. 0:05:00 - It may be a given considering the game, but the controls in this section are BAD. It's not so much the slippery and unresponsive movement but rather the way they interact with the clumsily shaped map. The most important thing here is to maintain momentum in order to save time, obviously, but also to catch the cycles of the moving platforms as early as possible, this is made very difficult by the incredibly jagged slopes, nitro dodging and (sometimes) solid checkpoints that you will roll into and bounce off as if it was a wall. Doing this right has been the cause of more resets than you can imagine, but I managed really well in this run. 0:05:10 - Whenever I roll off ledges, like the one immediately following breaking through this wooden wall, I hold the direction opposite to the one I was moving in so I 'brake' as I clip the edge of the ledge, this is to kill my momentum when I land so I can adjust my angle easily, if I didn't do this I would career into the wall in front, bounce off and have to start my momentum again. 0:05:26 - One of the 'solid checkpoints' but I avoided it this time! 0:05:28 - I take both of the routes containing gems at the 2 forks in the path here, this is because they're both shorter and there's less nitro to dodge. 0:06:24 - In the past I've been able to roll straight over the rock platform that falls into the gap but that's based on RNG - whether the larger rocks fall first or last, if they fall first then I would be caught and pushed off the platform and into the chasm, so now I wait to be sure, it only loses me a second or 2. 0:06:33 - By rolling onto this ledge I can line up a little outside of where the gears are and roll off to fall into the bucket below, skipping all the gears. 0:07:06 - The ants are more trouble here than they ever are. The swords they carry have hitboxes all the time and they out-prioritise any attack Crash has, this means that even when the ants swing their swords backwards over their heads before attacking they will hit me if I'm belly flopping them, because of this; my main concern here is assessing where the ants are spawning and walking to decide whether to attack them, clearing my way, or not. I also find that the ants typically spawn clockwise from the gate in front of Crash, so I go anti-clockwise to get the first 2 buttons with little fuss. 0:08:27 - When you enter the trigger than turns you into the ball it auto-spawns Cortex with you, there's no need to take him yourself. This ball sequence is probably the most stressful of them all because of all the nitro, it's really hard to maintain momentum and keep manoeuvring around the nitro, which has a deceivingly large hitbox and will ALWAYS kill you no matter how many Akus you have! 0:09:04 - I've had so many perfect runs up to this point fail because, for some unknown reason, I've fallen straight through the moving platforms, killing Crash. It's also possible to have Cortex die if you position him to the edge of the moving platform where the higher ledge is, squishing Cortex between them as you rise. It's also worth saying that it's necessary to activate 1 set of crystals to delay the drill or else it catches you. 0:09:32 - Here's a fun bug, if you spin and release Cortex as you trigger the cutscene you will remain in control of Crash in his default figure and be able to use his jumps, slides and everything. This is mainly for fun as all it does is advance you around the corner a little to where I can't see Crash (I don't go any farther because it's hard to tell where Crash is going according to what direction I press at the time, so I would spend more time working out where Crash is when I leave the cutscene than I would save,) even if I would need to activate the nitro box. 0:09:54 - This is one of the tunnels connecting area to area where loading takes place, if I get through it too fast the game won't load and what you see happen here is the result of trying to proceed, the time that you can see things spawn while Crash is falling down is the time I waste, but it was only frames this time. 0:10:00 - Now back in NSanity Island, first thing I do is line up to slide into the cutscene, this is so I can mash X to skip the cutscene and get a slide jump when I leave it, if I hadn't done a slide I would leave the cutscene mashing X and I would just be jumping. It's hard to tell when the cutscene has actually been skipped because it often loads slowly, skipping it later, so I prefer to mash X rather than wait, this is the same with all the skippable cutscenes except for 2 later on. 0:10:14 - Here I start setting up for the first major skip of the run, this will avoid having to go through the Totum Hokum area which saves a lot of time. Firstly I turn the camera around so that when I get to the rock I want to jump on I can see on top of it so I know where I'm going, if you check the rock for yourself you'll see it's one heck of a mountain to climb and there are very few visual cues. I jump onto the tree from the hay by lightly tapping up so that I know I'm as far over the edge of the tree as possible, then I 'flam' down-right, or rather SSE, on the analogue stick with the following double jump to get as much height as possible. It has taken a lot of practice to get the timing right for all this. Interestingly this is a PAL only skip, the NTSC version has a tree closer to the exit of the mines that you can simply jump up to get to the higher area. This would be one reason for me to run NTSC, although, I currently don't have any competition from anyone using NTSC (or PAL for that matter,) so I don't mind using this PAL skip. 0:10:25 - This is a simple belly flop trick to reach the higher platform, this skips the worm hole minigame and a cutscene with Cortex. 0:10:30 - The last of the NSanity Island gauntlet of major skips. I line up to see a small white patch high up on the rock, there's a tiny area that I can land on that will give me another double jump to make my way around the wall, there's then a larger area further around that I can jump on to fully traverse around the trigger for the Tikimon boss. You can see the camera focus on the idle boss head that I run straight past, it also still has a hitbox so I try to be sure not to run into it. 0:10:46 - It's worth noting here that Crash has a very long falling animation that occurs when you land from a long fall, using the spin as I land I can cancel that out and proceed faster. 0:12:18 - I've NEVER been hit by this bat before, not even in practice, I managed to save it but I still lost Aku which I need for a damage skip later on, fortunately I have a fail-safe to get another Aku without losing any time. 0:12:24 - There's nothing in this climb area that can't be sequence broken, it was fun to route plan around the rotation of the moving scoop platforms. First off I can jump onto this light to jump onto the first gear, this skips running around the room to ascend the platforms to the left. 0:12:27 - All the gears in this room have an invisible block around the middle that prevents Crash falling through, it takes a little more than a double jump to get up there but every single gear has some way of getting high enough. For the first gear I can double jump off the crates to get onto this invisible block, this allows me to jump into the scoop above to take me up, skipping 2 other gear sequences. 0:12:40 - I buffer a slide jump to get a long jump off the next floating platform to gent over the gear, this will take me straight to the top of the room, skipping more gear sequences. It might look like I was able to get into the first scoop as it came around but I've never been able to make it in time, I also didn't want to risk falling off the gear by trying. I use another camera glitch here; by pointing the camera away from the gear you're standing on the game stops loading the gear as turning so Crash stays still, it's useful to make sure Crash is in the right place for jumping up. 0:13:03 - These jumps around the nitro are really tricky. Upon landing the first jump I can sometimes fall into the chasm or get caught by the nitro; this can happen if the platform swings too much - Crash won't move with the platform completely, only a little bit, this means the nitro can move into Crash if I don't jump. The second jump is even trickier, I want to land right on the edge of the platform to avoid triggering the nitro and this is made even harder by the platform swinging about. Both these jumps skip waiting for the TnT to activate. 0:13:09 - I pick up the Aku here for a damage boost; this doesn't waste time because I would have to wait for the next area to load if I get there too soon. 0:13:57 - Here goes the hardest skip in the run. I start by positioning Crash over the checkpoint box to throw Cortex to the left so he lands on -something- on the wall, this is because I need to buffer a slide jump - but I also can't get over the red pipes with Cortex, I specifically want Cortex to land on something solid because that's the fastest way for him to teleport back to me, if I had thrown him into the water it would take him longer. 0:14:00 - I start the slide jump at the position of the wumpa, this is the safest way to ensure the slide jump will (only just) make it over the red pipe, it's also the most convenient and fastest place to buffer the long jump. I then pick up cortex to proceed to the next jump... Unfortunately I miss the long jump to get over the gap and die; this lost me about 10 seconds. 0:14:17 - When I throw Cortex I don't want him to hit any of the bats, this is because I want him to spend the time it takes for me to get over to him killing 1 bat with his gun. It takes 2 shots to kill a bat with the first paralyzing them and clipping them into the floor - so I don't want this to happen to the 2nd bat. It's important that Cortex does kill 1 bat though as having 2 bats alive would complicate the next part. 0:14:24 - Here I line up Crash to be as close to the wall as I can be without affecting the bat's AI. The way the bats work are that they fly about looking for Crash and when they see him they start to pursue, when they get close enough they descend into a swoop that closely tracks Crash until he gets hit or gets away, the problem with being too close to the wall is that the bats will stop the swoop animation early to avoid clipping into the wall. 0:14:28 - I see the bat starts swooping, I throw cortex, take a hit from the bat, jump, ride the bat up until I regain control of Crash after the hitstun then jump off the bat to get onto the higher platform. This really was a headache to get consistent! The most important thing is timing the Cortex throw and executing the jump onto the platform fast enough so Cortex decides to teleport to me up top rather than below with the bat, if this had happened I would have to run to the checkpoint in the opposite direction of the exit and kill myself to respawn with Cortex negating the time gained (I need Cortex to be able to crack open the ice window at the end of Ice Climb to proceed.) Getting this skip first try gained me over 40s over doing the area with the old skip, despite the death. It's also worth noting that the whole area around the platform except where I jumped up is an insta-death plane, this is why I can't do any fancy platforming to get up there. 0:14:43 - I use a long jump to cross the gap to the switch area that, usually, only Cortex can access, skipping the switch sequence. 0:15:59 - This boss is easy, there are only 2 things that can go wrong: 1, he decides to moon-walk over the centre button and 2, he hits me as the cutscene marking the end of the fight starts. The problem with the first is that he doesn't telegraph this, I'm pretty sure it's a bug too, something about the game deciding he should have walked in one direction rather than another and the game has him slide to the opposite side of the arena to rectify it, because of the damage boost I don't have Aku either so it would kill me. The problem with the seconds is that in this situation I would leave the cutscene with Crash at the bottom of the chasm beneath the death-plane, there's nothing I would be able to do but quit the game. As for beating the boss, the fastest way to do it is to throw Cortex to the switch, activate the button then run to get Cortex - repeat. 0:17:10 - The shortest death skip in the run, the checkpoint on top of the farthest right girder activates when the Cortex teleporting cutscene plays, so when i gain control I can run off into the chasm and respawn (literally) a hop, a skip and a jump away. 0:17:18 - I buffer a slide jump over the first gap to the empty platform to get a long jump off the following gap, skipping the TnT/nitro sequence. 0:17:39 - You can make all these jumps without waiting; it's not a risk at all. 0:17:57 - Another case of sliding into cutscenes to mash X. 0:18:11 - Here I've taken Cortex out of the area I'm supposed to fight ants in, I line up over grate markings on the floor as best I can to throw Cortex below to activate a checkpoint that I kill myself to respawn at. It's a really tricky throw that has it's good and bad days, if I had missed it twice I would have continued but I was very pleased to get it first try. This skips upwards of 6 minutes of combat and cutscenes. 0:18:40 I'm not actually supposed to have Cortex with me at this point, so I do the tunnel sequence a little differently, it's ultimately faster than without cortex but it's still a bit finicky with Cortex's respawns; if I'm too close to that edge of a platform over a chasm Cortex will respawn over the chasm killing himself and respawning Crash at the checkpoint (Crash won't lose a life point to this,) so I try to be a little delicate to where Crash is positioned according to the timing of Cortex's respawn. 0:19:02 - This cutscene is... wrong. Cortex is supposed to be leant over the railings looking out over the ice but instead he's leaning over thin air into Crash's backside. Nice. It's funny how the situation resolves itself when the cutscene ends because if you throw cortex as you enter the cutscene trigger you'll start the humiliskate without him, skating on nothing, this would be cool to do except often Cortex decides appear and kill himself at random points down the level causing Crash to respawn at the earliest checkpoint. 0:19:54 - By holding O and jumping at the edge of a ramp you can get amazing height and distance, this doesn't save much time on its own but it's useful for a skip in the 2nd humiliskate later on. 0:20:42 - This rail has killed me so many times. The game tries to auto-correct you onto the rail but if you're *slightly* holding a direction it sends you flying, so I like to line up for the rail early and when I see the penguins explode I let go of the controller to allow the game to put me on the rail, it's stressful but also the most consistent method I've found. 0:21:56 taking this side route around the gear/chasm is both faster and safer than doing it the intended way as even if I activate the ramp to jump over the gear it will kill me 80% of the time. 0:23:12 - I don't really mind this death as there's a checkpoint exactly to the right of where I fell, I also always expect to be screwed over by the rigidity of the slide jump that wouldn't let me correct my angle onto the platform. 0:23:37 - I could be slide jumping here but I didn't want to risk falling of as I would have to sit through the N-Gin cutscene again. 0:23:47 - All this skip takes is a double jump off the very edge of the lower ramp, it skips a platforming sequence around the room to come up the higher platform's left. 0:23:52 - I buffer a slide jump to long jump over the gap behind the sack; this is a tiny skip to avoid having to spin the sack around to use the platform opposite. 0:24:04 - You can cross the gaps of the 2 outside rotating platforms with a double jump but the middle one is too large, so I buffer a slide jump over the first gap to long jump across the second, this gives me enough time to catch the rising platform at the back of the room in its' first cycle. 0:24:16 - These spring missiles have to be THE MOST UNSTABLE thing in this game, there are a whole host of errors that can happen if you jump on them just too early: They can disappear entirely, act like an idle platform without a spring, push you off and stop you jumping until they load (what happened to me.) You can see I paused a little before jumping onto them in the hope that they would load but it seems I was a little too early. Fortunately there's a checkpoint immediately before so I didn't lose too much time. 0:24:28 - I buffer a slide jump over this gap n order to long jump over the next, skipping the use of the last 2 spring missiles, but awkwardly enough the missile sprang up to its' peak just in time to catch me in the air, i recovered seamlessly though. 0:24:38 - There's a small part of the ledge sticking out under the rail that I can get an extra jump off to get over the rail. There are a few tiny ledges like these that I use in the run, these are ledges you'll often be pushed off if you don't jump off them fast enough so timing the second jump has taken some getting used to. 0:25:00 - In N-Gin's boss fight you need to wait out his missile phase until he throws TnT at Crash, you need the TnT to land next to the wooden supports to blow them off. What makes this harder than it seems is that anything with spikes on in the arena will kill you; so you have to be really careful about getting close to the supports and not walking into them as you do need to be very close to them for the TnT to have an effect. The rest of the fight is just running about, nothing difficult. 0:26:37 - My method for this chase section has been to roughly memorise the obstacles so when I see them come up the bottom I know how to react. I've tried to map out where to use more slide jumps but for the most part it's too risky as something will always kill me or slow me down, now I will only use slide jumps when I know it's 100% safe to use them: 3 at the beginning, 1 in the middle and 3 at the end. 0:32:55 - If I mash X to skip this cutscene and skip it too fast the game won't load correctly causing me to fall through the floor into a death plane respawning me at the top of Ice Laboratory. 0:32:56 - The fastest way to take out the ants is to time the gun shots with the gate opening and then tap square at a slowish rhythm, if you mash square the ants will keep spawning through the gates and you'll run out of ammo so you have to wait for more. You can see only 1 ant spawns from each gate and barely touches the floor before I kill it. 0:33:11 - Crash's invisibility is a loading error caused by beating Cortex's combat section too fast, it doesn't slow me down though so I continue with it until I actually need to see crash. I can solve this effect by spinning. 0:33:26 - This jump begins the 2nd major skip of the run. By getting access to the corridor behind a particular locked door I can skip doing the Boiler Room Doom level and the Dingodile boss fight saving upwards of 10 minutes. I do this by first belly flopping onto this door, this works for the same reason as the gate in the Mecha Bandicoot boss fight. 0:33:35 - I then jump to the topmost area of the roof, this is the fastest way to traverse the roof around to where the locked door is. This part is really tricky because I can fall through the whole flat area to the left to my death and if I fall down the right it can be a real struggle to get over and around the invisible walls to get back up, so this really is a tightrope walk across the roof. I like to spend a little time adjusting my camera so I can see exactly where I'm going, thus reducing the chance that I fall off. 0:33:40 - Here I need to jump around an invisible wall blocking my progress across the solid part of the roof. 0:33:45 - I know when to drop into the corridor below when I see this specific roof texture to Crash's left. I then walk slightly into the back of the locked door to load the next level then proceed. 0:33:53 - Jumping on TnT triggers is a little faster than spinning them due to the different animations. The risk with jumping on this trigger in particular is if I'm just too far over the trigger then the nitro will blow me up, so you can see me flinch and jump away from the nitro when I trigger them in the hope the nitro won't catch me. 0:33:03 - You can get past all 3 of the zombie kids by slide jumping quickly, I mess up the first one because I aligned my first slide jump slightly off and into the first cabinet, I resolved this by getting to the TnT trigger before I needed to hide so I lost very little time. 0:34:41 - If you slide jump into loading zones at the right time Crash gets thrown forward much farther than usual, this is incredibly unreliable as you would need to keep track of how loaded an area is, where the loading zone is and when to slide jump. I just got lucky here. 0:35:03 - This room has many names, all given by the Crash speedrunning community, none suitable for these speedrun notes, it's just a headache for casual play because of the problems with depth perception. The Depth perception is already awful for small platforms in this game but this room is by far the worst offender. I can sequence break the entire climb, though, meaning I don't have to deal with all the small platforms and camera problems. 0:35:07 - Instead of running around the room to get to these bounce crates from Crash's left I can just jump up to them from the first ramp. 0:35:11 - These broken floor supports have a small ledge around the outside that I can stand on and jump around to the right, this skips running around the room to get to the bounce crates that take me up a level. 0:35:15 - By going right from the bounce crates I skip running around the room again, My "out-of-the-box" thinking has rewarded me with an extra life! 0:34:26 - I then try to go right again and I'm rewarded with a slick of acid instead of an extra life. I can jump around the acid by jumping off the platform as far off the edge as possible, it's still difficult to make the jump around the acid even if get the jump and not fall off - I make a little fuss about it in the run but at least I got the jump. This was still faster than running around the room. 0:34:33 - I go right from the bounce crate up to the last level, activate the exclamation mark box to spawn some metal crates for me to jump on then proceed out of this room after getting a couple of tricky jumps on some TnT. 0:35:45 - The time loss is mostly negated by the fact that respawning from the checkpoint gives me a perfect line to the end of the room to use slide jumps, whereas before it would have been very hard for me to get the slide jumps right. I die here often because it's hard to adapt the controls as the camera adjusts itself, it seems I also got snagged on the cabinet; stunting my slide jump, which is unfortunate. 0:35:56 - Activating the TnT on the right clears the nitro on the left, you're supposed to do this then backtrack around the room, past where the nitro was, to get to the door, but I can simply double jump across to the door to skip that sequence. 0:36:01 - I jump onto this door to get out of bounds to start the next important sequence break. It's funny how the ceiling is solid on the outside but not on the inside. 0:36:04 - Where the yellow light is on the left and through the corridor there's a cutscene trigger that will swap my control of Crash to Cortex, I can jump over it and continue with a nice fast slide jump instead of Cortex's stumpy legs. 0:36:09 - I need to run back through this door once to load the area. 0:36:12 - If I can make the out of bounds jumps of the first or second try staying out of bounds, on the roof, through this section is much faster than running through the corridors because of the few gun related puzzles (although I -can- complete them all with Crash,) the nitro/crate dodging and the enemies. Annoyingly there are tiny invisible ledges pocking out into the roof where the corridor 'blocks' split, it's hard to tell where these ledges are and there are a lot of them; so I slide jump whenever there's enough space and jump over the ledges when I run into them, which is usually when you see Crash crouch for seemingly no reason. I also like to spam jumps around the corners because it dodges the ledges and there's no space to slide there anyway, slide jumping across the corners is also too risky because the distance I can travel over the corner is deceiving and touching one of the ledges will redirect me off the roof. 0:36:20 - Hehe, control tips for Cortex while playing as Crash. 0:36:38 - Here I drop into this large classroom and walk back into the door to load the room. I need to complete all 3 of these toad class rooms to proceed. The problem with exiting the rooms out of bounds is that I can jump on the door on the opposite end of the room but the way the roof is shaped always pushes me back in. I need to kill 8 toads in the first room, 16 in the 2nd and 24 in the 3rd. Interestingly I can continue killing the toads after the quota has been met if I kill them faster, this means I can keep killing them forever. Before I knew about the quota I would do runs where I kill upwards of 40 toads in one room and then feel really bad about the slaughter. 0:36:56 - This door jump is the hardest of all of them in the run, I was really lucky to get it first try as it can be hard to get up there even with visual cues. 0:37:25 - There's a time efficient way to pick up 1 Aku for each toad room, which is nice because it's highly likely I get hit at least once in each room, which I do in this run. 0:37:28 - In the 2nd and 3rd toad rooms it's important to time how I attack the toads coming out of the grate as there are a lot more of them coming out much faster. The safest and fastest way to complete these rooms is to use the spin attack over the grate and then move Crash to a safe distance until the spin becomes useable again, when I go back over the grate and attack. This is made very difficult because Crash and his spin attack are very small while the toads are very big, very fast, have large hitboxes and exit the grate at erratic times. I complete all the toad rooms as fast as I could ask in this run, though. 0:37:47 - I clear all the robots because I didn't want to risk missing the jump onto the door and dying. 0:38:20 - I jump to my death to respawn from the checkpoint that you can hear go off in the room below, this is to respawn with 1 Aku for the next toad room. I lose no time doing this. 0:39:02 - I need to jump into Nina's room then back through the door to trigger the cutscene and the switchover to Nina. It's impossible to continue through Nina's level as Crash because he can't traverse the sections that utilise Nina's bionic arm. 0:39:25 - I didn't bring Cortex to this cutscene, but if I had; this might make more sense. 0:39:31 - This is another case of the cutscene glitch where if you hold forward while entering the cutscene and continue holding it through the to the end you'll be able to control your character in this default pose until you move the directional controls back to neutral. 0:39:42 - Just a note on how Nina generally controls, she has a moderate walk speed and responsive directional movement with a large spin attack, this means it's easy to saunter about clearing groups of enemies with little fuss. There's no faster movement method than her walk, the only alternate method of movement is the bionic arm - which is only useable on specific targets such as the one here, and they're only useful for crossing mandatory gaps because of where they're positioned. 0:39:46 - For every tri-jump wall like this it's fastest to grab the rings on the right first, every time. It either skips using the lower ring on the left or the first left ring is too high to grab. You don't need to time the circle button presses here, you can just press X to jump from the ring and hold circle to grab the next. 0:40:09 - You can spin to avoid the falling animation similarly to Crash. 0:40:15 - Nina's bionic arm doesn't have a hurtbox when extended so I can take out TnT and nitro from far away saving time over sitting through the TnT animation. This always crossed me as odd because usually everything is likely to kill you regardless of whether it looks like you were close enough to get hit or not, but Nina just bosses the TnT like she don't give a damn! 0:40:28 - There are numerous spots in this level where there are groups of rats placed beneath where you land after using the grapple rings, this is a problem because you have no control of Nina until she lands meaning it's always possible that you land on a rat causing you to take damage, die or bounce you off the platform into the chasm... to your death. This makes it the only place where RNG is prominent in the run. To make this safer there are places where it's time efficient to pick up 1 Aku for each set of rats. 0:41:16 - Rats can bounce you into the nitro here. 0:41:28 - Rats can walk into you while using the bionic arm causing all negative effects listed above, so I prefer to kill them all if they're in the right place. It's also worth noting that rats are actually pretty big and fast considering the amount of space on the platforms, they also don't track you so it's impossible to determine where they're going to be when you get to them and where they're going to walk when you're near them. 0:41:54 - This is one of the many 'Metroid doors' in the run, it's just a door that only opens when the following area has loaded, going too fast means I get to the door too early. This doesn't lose any time, it just negates a few seconds of time gained. 0:42:47 - When I land I need to spin almost immediately because the ant I hit will always run straight into me as I can't see him before the camera adjusts itself, giving me less than a second to react. 0:43:18 - I lied before, you have a few frames of control of Nina before you land after using grapple rings, unfortunately it's incredibly difficult to determine if the direction I'm holding is the direction the games going to send Nina due to the way the camera is moving. More often than not pressing any button during this time period will drastically fling me far away from the platform to my death. Due to this I opt to release all control until I land, similar to the rail autocorrect in Slip Slide Icecapades. 0:43:45 - The bus is deceptively fast and will catch me if I get snagged on anything a couple of times. 0:44:00 - This exclamation mark box activates a wooden crate bridge that I use next, it's impossible to continue without it. 0:44:18 - There's no particular reason I pick up the 3 Aku power up here, just for the lols. The 'invincible' power up does little to nothing in this game, it doesn't increase movement speed (noticeably anyway,) and is still vulnerable to TnT and nitro, heck I've even been hit and bounced back by enemies with it active before. 0:45:21 - By standing with Cortex's feet half way over the crease between these 2 pipes; the centre pipe will push Cortex a little to the side making me safe from that pipe being active, what this also does is make Amberly think Cortex is still on the centre pipe so she keeps activating it. This saves time as it stops her turning animation while she chases Cortex around the pipes. Walking using the directional movement cancels this effect, shuffling about using the right analogue stick (camera controls) does not. 0:45:37 - In Amberly's next phase she throws bells at Cortex which I need to shoot away to open up her back so I can take out a life point. This is mainly just mashing square as fast as possible so that I can trigger the next phase faster and so I don't get hit, which will restart the previous pipe phase without me having dealt damage. I was having trouble in this run because Cortex tends to shoot in various directions even without moving him myself, this is almost random but mostly to do with what standing position/animation he's in. This didn't lose me more than a second or 2; it was mainly just a bit awkward. 0:46:54 - I run to this pipe on the right because when I beat Amberly a moving platform will come to the right for me to jump onto, if I try to run to it from the centre pipe I won't get to it in time. 0:47:17 - This is another 'Metroid door'. The time it takes to open all the Metroid doors is consistent so I'm never losing time. There's been some discussion as to whether NTSC loads these doors faster but any proof has been unconvincing; this is because it's always possible that the runner has been slower getting to the doors than I do in said proof. 0:47:46 - This platform always lowers at the same time regardless of how fast you get to it, you just want to get there fast enough to catch the first cycle. 0:48:55 - For some reason I always forget to skip this cutscene, I managed to catch it at a reasonable time though. 0:49:56 - I've never been killed by these nitro but it's always smart to expect them to, hence my patience with going through. 0:50:38 - Here I start the 2nd and last humiliskate, this is much harder than the first as there are nitro scattered everywhere with ants roaming the slopes who act very similarly to the rate from Rooftop Rampage meaning they could be anywhere, I also have to keep in mind where Evil Crash is as he does have a hitbox and as I go fast enough I can often run into him. I've tried to make routes through this level which will both maintain my momentum and consistently dodge the ants thus being as fast and reliable as possible. Fortunately I have no troubles with the ants or Evil Crash in this run. 0:50:57 - I need to let go of crouch (circle) here in particular as I would fly off the hump on the left and into the nitro. 0:51:14 - There's a small ledge off the slope just before the chasm that I can't see, releasing crouch to land on it to jump off it is the only reliable way I've found to make the jump onto the platform in the middle of the chasm. 0:51:28 - I saw the ant was on the right so I went left around it, I didn't expect Evil Crash to hit it towards me which surprised me. 0:51:38 - This is the only viable skip using the extended humiliskate jump, I jump off the slope in the right while holding circle to get this long jump over the nitro, saving a little time and lining me up for the next nitro sequence. 0:52:04 - I died here because of the turning bug I mentioned earlier. I landed while going too fast, I held right to turn around the nitro but I just rotated right, sending me to my death. There's no way I could have avoided or foresaw this as hanging right would have bounced me away from the wall and into the nitro, Evil Crash can always run into the nitro himself and getting the right line off the cliff to get past the nitro is always hard because of the unresponsive controls going through the previous nitro. 0:52:14 - I died again because I wasn't holding circle long enough to go fast enough over these nitro crates. Both these deaths lost me 20 seconds. 0:52:23 - You can see here that Evil Crash can clear the nitro if he wants, which he also did when I died the 2nd time. 0:53:10 - I go right here, away from the cutscene at Evil Crash's house which would normally progress the game, to begin the 3rd and last major skip of the run. 0:53:19 - I need this ball to use as a platform to get high enough for the next jump. 0:53:23 - It's a mystery to everyone what this explosion was, it even happens in casual play... beats me. 0:53:30 - Sliding the ball up this seam gives me just enough room to execute a glitch that will throw the ball right up to the higher platform. 0:53:35 - By spinning between the seam and the ball as it's in this position throws the ball at an abnormal height and speed over Crash's direction and onto the platform above. There's a tiny spit I can jump off in the seam, you need to lightly press Crash towards the wall to consistently find it (you also can't stand on it, you just slide down again,) so it's important to time the jump correctly. 0:53:38 - I then roll the ball to the back wall, jumping off of it gives me enough height to jump and belly flop onto the platform above. This gives me access to a tunnel that takes me straight to Ant Agony, skipping all of Bandicoot Pursuit and saving upwards of 4 minutes. It's possible to do this skip without the ball but it requires using more of the tiny invisible ledges on the walls, this is pixel perfect for landing on the ledge and frame perfect for timing the jump, making it incredibly unreliable, I don't spend much time getting the ball anyway. 0:53:50 - Here I need to wait for another loading zone, you get to see me walk into it before it loads, once. 0:54:27 - I get control of Crash before the cutscene ends so I can hold up+left to move towards the doors as early as possible, which doesn't actually matter because I have to wait for them anyway. 0:54:58 - Ant Agony is a case of "Final level of the speedrun-ism" where I've practiced and optimised this level almost as much as the first level, just so I'm always prepared when I get here at the end of a run. This means I can do things such as optimise single jumps across these moving platforms, but it also means all stress induced mistakes are even more disappointing. 0:55:26 - By taking a hit from these drill ants I can use the resulting invincibility frames to jump off them and over the gate, skipping using the blue lights to open it. 0:56:09 - The fastest way over these coloured platforms is by jumping between the 2 red platforms at the back in the same cycle, this allows you to reach the green platform at the back in time to exit the coloured platforms thus skipping 1 extra cycle. To make the jump between the rep platforms in time I need to time a short double jump that will just make the distance before they disappear. There are alternative routes for making this equally fast starting from each coloured platform, blue is easiest though, so I got lucky that I got there in time for blue. ***I apologise for the graphical glitch when these platforms flicker, it's been a consistent error with encoding. All the platforms are doing are flicking the lights on and off before they disappear. 0:56:19 - I need to kill 4 out of 5 of these ants to unlock the button and proceed. 0:56:25 - Again, Lv.3 Aku is unnecessary. 0:56:41 - Crash's control of the balls in this area are awful, especially when you try to slide them on these small platforms surrounded by chasm. If you slide beneath the ball you get a short, harmless, slide, but if you misdirect the slide just a fraction Crash will career into the chasm to his death. This place in particular is a long way from a checkpoint so you can see me jump back into the platform when I see Crash close to the edge in order to prevent falling. 0:57:19 - If I fail this belly flop skip Crash falls to his death, negating any time I would have gained over runner around the room the intended way. This isn't as risky as it sounds because it's very easy to execute, the timing on the belly flop is pretty lenient. 0:57:26 - I didn't get the long jump I needed to get to the 2nd platform, fortunately I reacted in time to reach the left of the first one. 0:57:34 - I spin the ant toward the gate to make the spacing easier for when I jump onto him and over the gate. This skips the blue light puzzle to the right. All enemies have a hurtbox on their heads that you can jump on to bounce off and deal damage. I can't do this with the gate skip earlier with the drill ants because the drills on their heads cover 90% of the hurtbox making it very difficult and situational. 0:57:39 - Fun fact: This is where long jump was discovered. 0:57:45 - I need to kill 13 ants to unlock the button to proceed. Ideally the route is to go clockwise, killing the ants on their spawning platforms, starting with the ant I kill first meaning I end at the same place next to the button, the AI can be unreliable though, as was shown in my run. I didn't lose any time to the ants moving about too much but it made moving around them a little awkward. It's also worth noting that the ants take 2 hits to kill and they die instantly if you push them into the chasm, so if you see me hit them twice it's to kill them, not to push them into the chasm. 0:58:53 - I know I have enough time to make it across these platforms when I the back 2 split from the first. 0:59:02 - The rule of thumb for this platforming segment is to always jump onto the first platform then compensate with the laser as it moves over the middle, this is because the laser only moves from between the 2 side platforms and over the middle, making Crash safe on the edges, it's also at least 80% consistent and the fastest way to traverse this section. I got amazingly unlucky when I got caught by the laser bouncing me into the chasm, I was so close to landing on the middle platform, which usually happens if I get hit. 0:59:08 - I kill myself here because I accidently ran into the pyro ant thus stopping me making it to the red coloured platform in time for this cycle, killing myself here to restart the cycle is faster than waiting for the next. These 2 deaths make the largest time loss caused by deaths at 36 seconds; it also marks the last death in the run making about 1 minute of death related time loss altogether. 0:59:46 - I was amazed that I had gotten hit by the laser again; it was a first to get hit by both in a single run. Fortunately I did land on the middle platform this time, as I mentioned was usually the case if I get hit by the laser. 0:59:54 - Jumping to this disappearing platform across to the far side skips using the 2 platforms to each side. 1:00:00 - There are supposed to be 2 ants standing by the bomb spawners to throw bombs at Crash, it's pretty common to have ants walk away or walk straight off into the chasm, as you can see here. 1:00:05 - Using the elevated light on the floor I can get enough height to belly flop over the purple gate, skipping another blue light puzzle to open it. 1:00:16 - Similarly to the previous 'chasm jump' I can fall to my death if I don't make this jump, it's also just as easy as the previous one, it's even possible to jump up here without a belly flop in NTSC. 1:00:19 - Here starts the last, and largest, coloured light platform sequence. There are many ways to do this fast but the main this is being able to react to what colour you get to the platforms at, here I got to green first and executed well. 1:00:24 - Getting to green first gives me time to make this tricky jump across the reds thus skipping a full cycle and getting me to the next set of platforms in time for the red again to proceed. 1:00:40 - The last set of platforms are always the same. Starting with yellow I move around to the green to make a jump to the blue on the left, skipping 1 intended cycle. 1:00:47 - I then need to make the jump to these red platforms as early into their cycle as possible, this gives me just enough time to make a well timed short double jump to the next red in order to get to the green at the end and exit the coloured platforms, thus skipping another cycle. 1:01:05 - If you take the green balls up to this centre platform when the ants are there to run into it; the ball will bug out and fling itself far away, this is why when I see the 2 ants to the right I decide to go and take them out. If they hadn't been there I could have dropped down to the right, picked up the ball and span it through the nitro at the back of the room into the switch. I can't do the same with the left ball because I would need to go around the middle platform to get to the bomb and clear the nitro on the left that's blocking me taking the left green ball up. I could blow up the nitro on the left with the left green ball but it takes more than 1 ball to blow them up from the bottom so I would need to wait for the ball to keep respawning, thus losing me more time. 1:02:38 - The last loading zone trouble in the run! I need to wait for the final boss to load and the gate to appear in front of me to proceed. 1:03:02 - I love how at the end of a WR pace run you get to the final boss gauntlet and suddenly it becomes the most epic it's even been. I expected this from my Final Fantasy XIII and XIII-2 running but not Crash Twinsanity, which made it even better. 1:03:07 - The fastest way to pass the first phase with Nina is to go clockwise starting from the left, this is becauseThe Twins' AI is set to prioritise the batteries on the right, meaning it takes a little longer for them to decide to move to the left, thus giving me a little more time to move how I want without having to spend time dodging attacks. Moving clockwise is also nice because the highest ring I can reach to grapple on the 2nd and 3rd set of batteries are on the left meaning I'm automatically lined up to use them when I get there. 1:03:59 - The 2nd phase is just a lot of mashing. You can only deal damage to each arm when the one in question isn't firing, rationally that means you should be switching between each arm as they alternate firing, unfortunately that's not how it works and it's actually a slower way to finish the fight. The fastest way is to shoot the right one away first, switch to the left one - dodging all the hits until The Twins are down to their last life point, then take a hit so you don't waste time running and adjusting your shot. The reason the right gun needs to be taken out first is because as you run around the right it's impossible for the floor blast to hit Cortex whereas running around the left Cortex can be hit by the left arm, thus suffering hitstun while dodging the attacks from the right arm and missing out on the damage boost at the end. 1:04:43 - The last phase is the most simple; by pressing square Mecha Bandicoot shoots missiles out his left arm, I need to fire them at The Twins through the gaps in the circulating shield to deal damage. It's possible to land 2 hits for each opening but that's very tricky as it's hard to determine where Mecha Bandicoot is firing because his left arm is wholly covered up by his left shoulder. 1:04:51 - The timing of the run finishes when the final hit is dealt to The Twins in the 3rd phase. This ends the run at 1:04:39.88 or 1:04:39 by SDA timing. The run loses just over 1 minute of time due to deaths. Of all my 6+ months of seriously running this game this is the lowest loss of time to deaths I've been able to get by over a minute. Crash Twinsanity has been a game where a deathless run seems to be very unrealistic due to the erratic controls and inconsistent and awkward nature of the mapping. If this ever happens (by a miracle that I do it,) or if someone else actually picks up this game then I can't wait to see the result. The run also suffers from some 'safe' movement at times, such as not slide jumping at opportune points, although I'd like to say this is infrequent and only lost me 10-20s at maximum. I also had a little problem with clumsy movement executing the door jumps in Academy of Evil and general non pixel-perfect routing that might save me a little time. Overall it is widely considered that it's impossible to get this game below 1 hour. I believe a perfect run would be 1:02:##. Thank you for watching and reading my comments on my speed run, it was a joy to do and of course made even better by the motivation and the support from all my friends who were there for the journey. I hope this has been an interesting insight into Crash Twinsanity speed running. This game has been a large part of me recovering from some severe depression. It allowed me to meet some amazing people and make some amazing friends and ultimately take me to the European Speedrunner Assembly charity speedrun marathon which was easily one of the best weeks of my life. Finishing this speedrun submission and completing these notes have marked the end of my depression as I get back into seeking work, so I tried to make these the best I can! I'm sure these lengthy notes will be of value to someone. You can find me on Twitch, SRL and SDA as DRsynj and my youtube is FingerMutt.